In every town, village, and hamlet are women who have seen beyond fear, who are strong enough to push back winter and bring new life to the lands. Their power comes from beneath an old, stone shrine, half-forgotten by the people of today. What secrets are known to those who dare pass through the mouth of spring? The Mouth of Spring is flooded cavern system underneath a quiet shrine. I really wanted to have fun with changing water levels—the caverns are navigable both while empty or while draining, but the logistics are quite different in each case. For those keeping track, the Wives of Spring were first mentioned in back in adventure #33 The Mermaids' Knot, where they had infiltrated the village of Magda to keep tabs on the worrisome cult thriving there. It works just as well with secret organizations of your own, of course! There are lots of ways to use this adventure in your campaign. 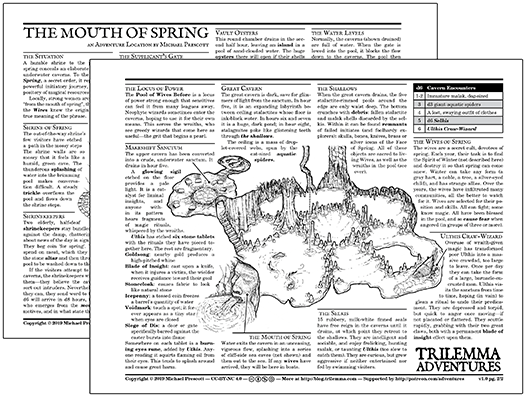 One, if your players are already connected to a secret order of some kind and are looking to get involved, you can use the Mouth of Spring as written, as an initiatory journey. This could either be an ordeal that must be endured to prove loyalty and hardiness, or (if your game has clerics or shamans) as an initiation into contact with a divine presence itself. If you're running a single-player game, this would make a decent in medias res start for a PC selected by the wives as a candidate, a first adventure of many (if they survive). Finally, being tossed into the pool shaft is a decent option for an adventurer found guilty of a serious crime, or otherwise being disposed of by creepy cultists. "Feed them to the Malak!" The etchings on the gate are a detailed map. 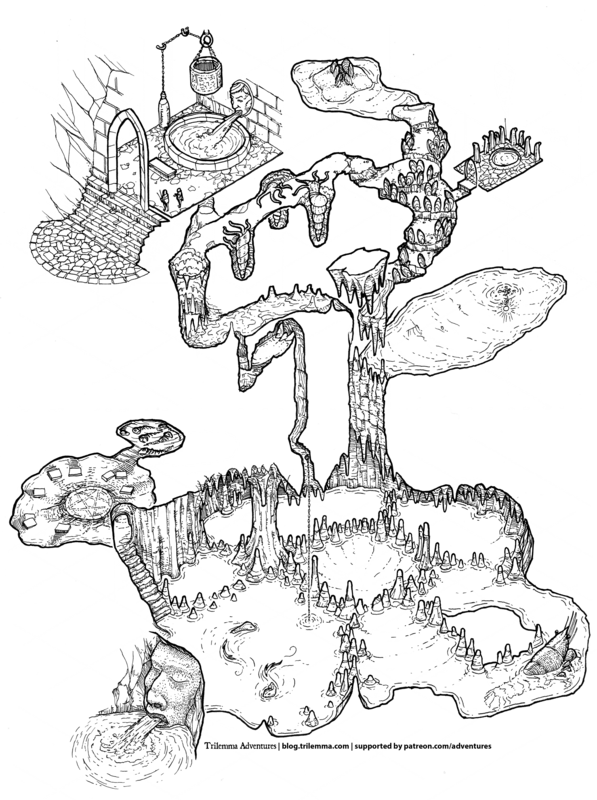 For adventurers who copy it or study it carefully, consider actually handing them a copy of the map image. This will give them some foreshadowing about areas of the caverns that aren't yet revealed, and will give them interesting choices. Do they float down with the receding water levels, or do they wait until the hall of the malaks is dry? As always, thank you to my patrons for supporting Trilemma Adventures. If you'd like to join them, toss a buck in my subscription tip jar.